Super Ski jump is a new and unique table top game of skill that’s a whole heap of fun. Played by 2 -4 players (8+) over three thrilling rounds, the aim of the game is to get your skiing character flying down the ramp, perform some tricks and then perfect a landing. Points are scored for the type of playing piece used, skis, bathtub, sledge or snowboard, how many flips and the type of landing. Practice makes perfect! After choosing your character and playing piece the youngest goes first. The ramp can be adjusted to one of three heights then the playing piece is placed at the top. Turn the knob to send the playing piece flying down the ramp and use your skill and judgement to press the button at the right time to send your playing piece flipping into the air. Count up your points and mark them on the score pad. Then it’s time for the next player. Each player has three turns, choosing a playing piece for each turn. Then all the scores are added up and highest score wins. In the box you will find the ski jump which requires some assembly, a landing ramp, four characters, four playing pieces, a scoring pad and a page of stickers. Once assembled the ski jump will not fit in the box, but you can take it apart. In my video you can see how easily my Little Man, aged 8, put the ski jump together again. This game is totally addictive and will get all the family wanting a turn. The game play is pretty basic, involving turning a knob and pressing a button, but with each different playing piece behaving differently, it’s not so easy as it looks. Also, you can adjust the height of the ramp giving each piece a different speed. Trying to perform the perfect stunt and then landing is a task in itself, but a fun one. You will want to keep trying and trying until you get it perfect, and then you’ll whoop with excitement when you do. Would you like a copy of this table top game yourself. It would make a brilliant Christmas present. Just fill in the widget below and keep your fingers crossed. You could be skiing off piste this winter! To find out more about Super Ski Jump please visit the Drumond Park website. You can purchase Super Ski jump for a RRP of £19.99 from Amazon, Argos, B&M Retail, Debenhams, Hamleys, Littlewoods and Tesco. 5. The data of anyone that enters won’t be passed on to any third parties or used for any unsolicited marketing communications. 6. This giveaway is in no way associated with Facebook or any other social media. 7. The winner will be randomly chosen, and will be shown on this post, with further notifications may be shared on social media. 8. The winner will be notified via email, and will need to respond within 4 weeks otherwise a further winner will be drawn. I’ve just been sent a fabulous cook book to review and the opportunity to give away three copies. It’s not just for Halloween but I though it would be fun to get this competition up and running in time for monsters of all kinds. The Hoxton Street Monster Supplies Cookbook is full of everyday recipes for the Living , Dead and Undead. I love it! I’m going to be cooking recipes from the book over the next three weeks while promoting this give away. There are recipes for Zombies, Wearwolves, Vampires, Mummies and Witches. A few of the recipes are translated into monster languages to make it easier for the monsters. The website also has the facility for translation which is fabulous for the monsters looking to purchase this book. Despite gruesome names like Warm Kidney Cupcakes, they are completely safe and doable recipes for anyone, even if you are not a monster. Take a look at this video for Maggot Brownies. The book retails at £13.00 and is written by Mitchell Beazley. 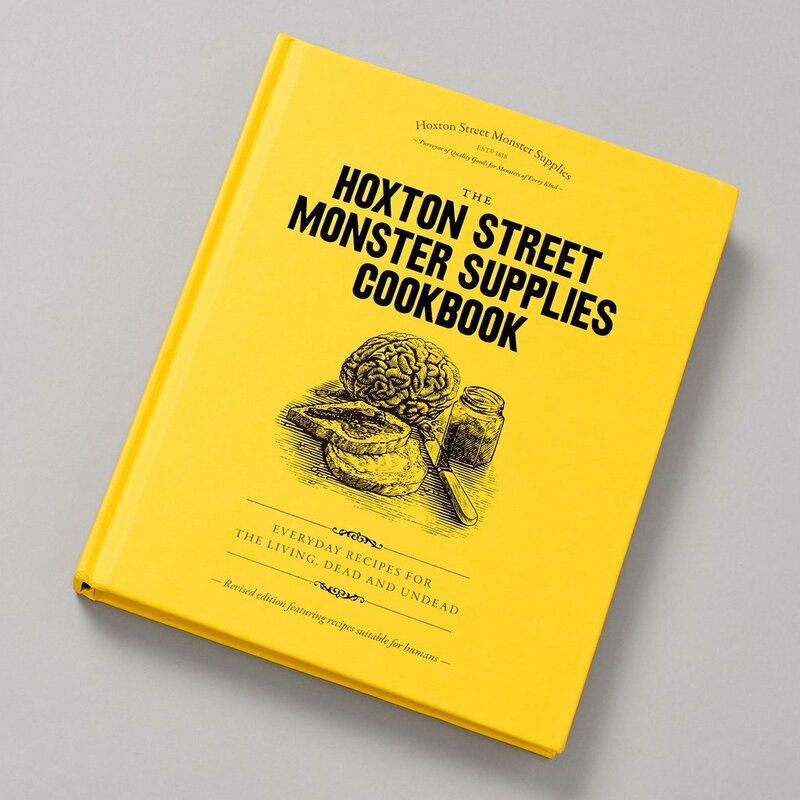 The Hoxton Street Monster Supplies Cookbook comes from the Hoxten Street Shop found in East London (unsurprisingly on Hoxton Street) and is the purveyor off all kinds of everyday items for the living, dead and undead. Due to a curse all profits got to The Ministry of Stories, a creative writing and mentoring charity for young humans. At the shop you will such goodies as Earwax Cubes, Salt Made From Tears of Anger or Banshee Balls as well as the fabulous cookbook. So if you are looking to treat that monster in your life, you now know where to go. So let’s get on with the competition. First up is a question: Which would you like me to cook? The question can be found in the Rafflecopter Gadget and you can answer in the comments. If you answer in the comments you do not have to fill in the gadget but it will give you more entries into the competion. Prizes must be claimed within 28 days after the close of the competition. I was asked if I would like to take part in The Activation Game and after watching the introductory video I knew it would be something I’d enjoy. This post is my review and a competition. All thoughts and opinions are my own and I am being completely honest while trying not to give too much away. So what is The Activation Game? Well, you can take a look at The Activation Game website for an insight. I have to tell you, I was sold by the trailer, I didn’t need to look at any more, I really didn’t want any spoilers. I will say that it’s probably not for everybody, but if you are looking for a way to improve the way you think about life then I’m sure you will enjoy it. The Activation Game is a 12 and a half week personal development course on rediscovering human values. It starts with a book which then leads you on a journey about yourself. It is not a self-help course, more of a new approach to human values and what makes us tick. I am currently about to start my fourth week and so far I’ve really enjoyed it. I feel like my eyes have been opened to how I think and feel about myself and how I react to those around me. Hello – is basically a quick hello to the week. Inspiration – Is an introduction to the theme of the week, usually in two parts. Reflections – asks you to ask yourself some questions on the theme. Meditation – is quite simply a guided meditation. Events – presents you with tasks to perform, these are not difficult. Goodbye – is a little re-cap. I’m not sure if the formation stays the same throughout the entire 12 and a half weeks, As I said, I’m not one for spoilers and I honestly haven’t checked, but I do promise to come back at the end of the 12 and a half weeks and let you know how I got on and how I feel about the whole course. Now The Activation Game is more than just a book, it is an audio visual journey with many parts. You will need a pc, laptop or tablet and internet connection to take part. I’ve found that sometimes headphones are useful too, but not a necessity. You have a puzzle to solve each week and I found the first one quite difficult but then I re-read the instructions and realised that I only had to remember that all clues related to the authors home country of Africa. This made the puzzles easier to solve and I was soon on my way. You will need time to work through this course but you don’t have to do each week all in one go, or even all in one week. You can work at your own pace and do as much or as little as you please. You are required to watch some videos but they are not too long, most of them are very short and all of them are inspiring. I’ve managed to do most of the tasks but not all of them. I don’t think it really matters, what matters is that I’ve given them all some thought and decided what I would do if I could have done them. (I am at a disadvantage here, being unable to get out alone) Most of the tasks are very simple, but they are also very rewarding and they can be performed while getting on with your usual daily life. The whole 12 and a half weeks are intertwined with getting on with your daily life. The authors have a vision of changing the world one person at a time. Is it possible? I’d like to think so. You must have heard of ‘pay it forward?’ It’s all about creating ripples, often tiny ones, but one person can change another’s life and in turn that person can change someone else’s. Human values are something we all have but do we stop and think about them enough? I’m really looking forward to working through the rest of this experience and would love to meet others who are interested in trying it too. I’ve been given five copies of the book to give away, so take a look at The Activation Game and let me know if you would like to try it. I will pick two winners from the comments alone and the other three at random from those that fill in the Rafflecopter widget below. So just to make that clear. You do NOT have to comment to enter this competition, you can just fill in the widget. Those that DO comment will be chosen by me on merit of their comment, so don’t just put, ‘I’d Love this’ tell me WHY you would love it, or what you think of it. Anything really, just make it interesting. Those that fill in widget will be chosen at random when the competition has ended. Do take a look at the The Activation Game Website and/or the book description on Amazon before you enter. I would love this book to go to those that really want to take part. Remember, it won’t steal your precious time but help you live better and enjoy your time.